Finding the right franchisees is one of the most challenging and critical aspects of building a successful franchise. Ensuring they are successful once they come on board is equally important. Sparktank is a franchise marketing agency that provides solutions to help you with these important areas of your franchise's growth. With over 20 years experience in web, print and online marketing, we'll work with you to develop marketing programs that fit your franchise's needs. 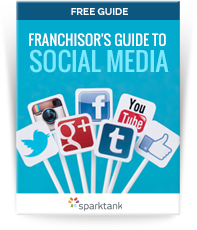 Managing a social media marketing plan for a franchise can present unique challenges. Use this guide to help you get started.